You're ready to kick opiates. We're here to tell you what opiate withdrawal is like. What should you expect, and when should you expect it? This is the tough part of detox, commonly mistaken for the flu. The good news? You get through this, and you’re through the roughest patch. Take hot baths or showers. Wear soft and loose clothing. Take your mind off the pain TV shows, movies, or magazines. Stay hydrated. Use ice packs or hot compresses. Write yourself notes (before you get to this point) that will remind you of your goals, and put them in your bathroom and over your bed or couch. Struggling to quit opiates? Workit Health can help you stay on track. The intensity of physical withdrawal will begin to lessen here. Remember that you are still in withdrawal, and take it easy on yourself. Be gentle and kind to your body and mind. Minimize commitments and avoid your using friends (and dealer). Change your bedsheets often. Be honest with those you love so they can support you through the emotional anxiety and irritability of opiate withdrawal. Dramamine or Antivert can help with nausea, and ibuprofen or self massage can help with body aches. The good news? You are moving past the worst physical symptoms of withdrawal. The bad news? You are moving into the emotional symptoms. Often overlooked, but just as important as the physical stuff! Ways to help: Exercise can help with emotional symptoms as soon as you feel physically up to it. You don’t have to start intense workouts. A gentle walk a day can boost your mood in the same way drugs once did. Try going to sleep at the same time each night and waking up at the same time in the morning. Good sleep habits help. Get support for your mental symptoms! With Workit, 12-step programs, or counseling. You don’t have to struggle alone. Cravings can linger, as can the mental effects of opiate addiction like depression. Strategies for getting through cravings like playing the tape through and thinking about your long term goals can help. A craving won’t last forever, and will eventually fade, no matter how intense it feels in the moment. Self-care is crucial for brain repair to assist with depression post-opiates. 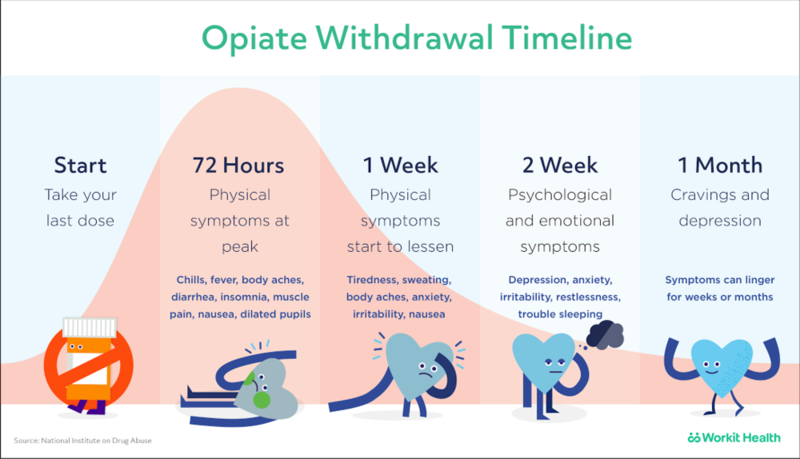 If you're looking up opiate withdrawal, you're already considering a change for yourself or a loved one. Just thinking about change is a first step towards a different life. And a new life is created by a series of small changes which result in a big one. You can kick opiates. It isn't easy, but it's so worth it. And so are you. Need more tips to make it through opiate withdrawal? We've got you.